Awhile back, I posted some alternatives to food gathering. In researching that post, I was pleasantly surprised to find so many alternative sources for finding groceries. But no matter where your provisions originate, the question persists: what is the best way to store it once you are home? Last year, we managed to successfully reorganize our dry foods storage, but the fridge can be a black hole. So much so that there are times I open mine with trepidation over what is going to fall out onto the floor. Unlike in Europe, where Ryou lives and works, the U.S. mandates that eggs be washed before being sold, which strips them of their protective coating and makes room temperature storage less reliable. So, unless you are lucky enough to get your eggs straight from your own hens, this method might not be so viable here. Still, I love the way it looks. 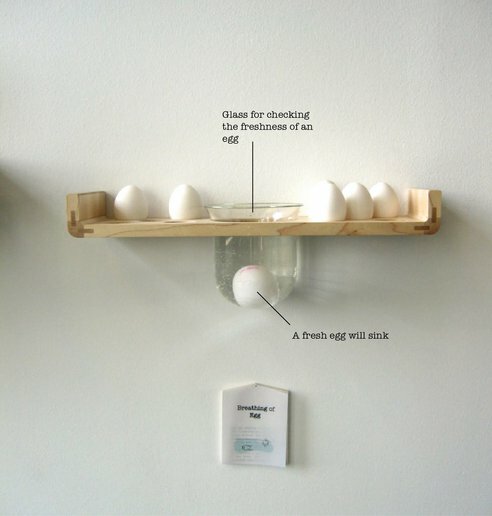 The point of this project is to get people to re-examine their assumptions about how we treat food and Ryou also keeps a Tumblr site where she invites people to post their anecdotal wisdom on how to store food – some intriguing (store a chili pepper in your rice to prevent bugs), some questionable (cover your eggs with vaseline to block the pores), but all fascinating. Her work asks you to consider the way each type of food wants to be treated, but also succeeds in conveying the visual beauty of food. 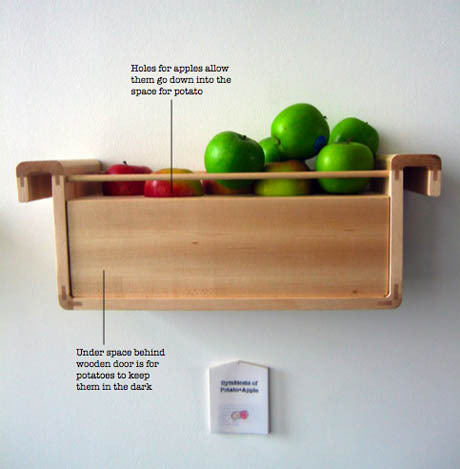 By displaying it on the wall, you can see what you have and are more likely to use it. If these were for sale, I would be first in line. Food52 recently ran a couple of useful posts on food storage, organized by counter, pantry and refrigerator. It’s a good outline on what to store where, but relies heavily on plastic containers and bags. The Berkeley Farmer’s Market was the first to eliminate plastic bags as part of their Zero Waste initiative back in 2009. They have published this handy guide for plastic-free food storage Berkeley Farmers Market Tips for Storing Produce . Last but not least, the Zero Waste Home, has a lot of great advice on waste-free food storage, my favorite being freezing bread in pillowcases! And if you are wondering how long something keeps, check out Still Tasty! So let the excavation begin! For more fridge-related voyeurism, check out artist Mark Menjivar’s portrait series on people’s refrigerators entitled, You Are What You Eat. It speaks volumes. This entry was posted on April 15, 2012, 9:33 am and is filed under housekeeping, inspiration, kitchen. You can follow any responses to this entry through RSS 2.0. You can leave a response, or trackback from your own site. So interesting, especially since coming home after 10 days away to expiring yogurt and wondering whether it is still safe to eat. Eggs at room temperature? I don’t think that would work for me, but apples and potatoes together–great idea. realize it’s not the case for everyone. Hi Hilda! Buying for the day is the ideal – what people used to do before refrigeration, right? Plus, the routine of the daily shop probably informs how you eat. I think it is hard to get out of the habit of having tons of food on hand, I know we are struggling with that very thing.